A solid budget electric toothbrush that performs adequately to clean your teeth. If you are looking for a cheap, basic electric toothbrush that does not have any of the premium features then this may be the toothbrush for you. P.S. If you want to find out my list of recommended electric toothbrushes click here. So why should you buy the Oral-B Pro 600? It is said that a third of people believe that they do not have to brush for as long if using an electric toothbrush. This is of course not true. Brushing for 2 minutes daily twice a day with an electric toothbrush can help the fight against gum disease and decay. This is why it is so important to have a 2 minute timer on your electric toothbrush. 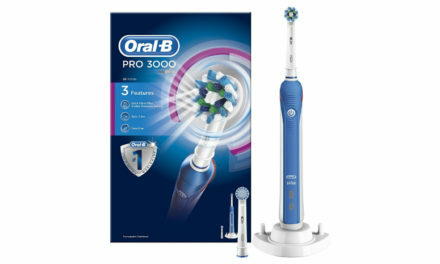 The Oral-B Pro 600 is a relatively inexpensive electric toothbrush with a 2 minute timer that attempts to bridge the gap between the Oral-B Vitality and the mid range electric toothbrushes like the Oral-B Pro 2 2000N, Oral-B Pro 2500 and Oral-B Pro 3 3000. Does the Oral-B Pro 600 fufill this role well? Find out in the detailed product review below. Due to the cheaper price point of the Oral-B Pro 600 does come with a reduced number of features. It only has one cleaning mode – daily clean which happens to be the most useful one. The daily clean mode is where the brush head oscillates 8,800 times per minute and pulsates 40,000 times per minute. This is good for regular use and cleans well. 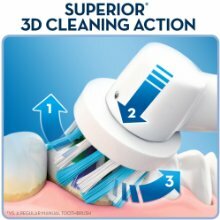 If I was being picky it would be nice if the Oral-B Pro 600 had the sensitive cleaning mode that reduces the speed and power for people with sensitive teeth. 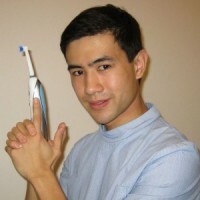 To get this mode you would have to upgrade to the Oral-B Pro 3 3000 . 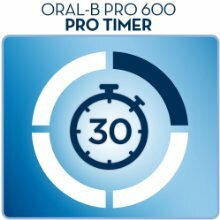 As alluded to earlier in the post, the Oral-B Pro 600 comes with a quad pace timer that “buzzes” every 30 seconds to let you know when to change area. This is a particularly handy feature as it will alert you when you have brushed for the recommended 2 minutes. It will also remind you to change area of your mouth as it is common for people to have a favoured side to brush. All in all, this means that the Oral-B Pro 600 will make you brush your teeth better. The Oral-B Pro 600 handle is an attractive pale blue colour and is slimline making it easy to hold. Coupled with the slimline profile, the handle is also rubberized which provides extra grip when it is wet. The handle is also waterproof which means that it can be used when in the shower. The Oral-B Pro 600 is missing some key features that the more expensive electric toothbrushes in the Oral-B range have. These include the sensitive cleaning mode which I find particularly useful. It also does not come with a wireless smart guide or blue tooth connectivity so will not work with the Oral-B app. The cheapest electric toothbrush that comes with Bluetooth connectivity is the Oral-B Smart 4 4000. The Oral-B Pro 600 also does not have a visible pressure sensor which I think is crucial on an electric toothbrush. The cheapest electric toothbrush that comes with a visible pressure sensor is the Oral-B Pro 2 2000. The mechanism of action for this toothbrush is Oscillating rotating which is the same across the whole of the Oral-B range. The Oral-B Pro 600 comes with the daily clean mode which oscillates at 8,800 per minute and pulsates at 40,000 per minute. This will for sure clean your teeth well if used for the recommended 2 minutes. Despite what Oral-B say that it removes up to “100% more plaque than a regular manual toothbrush”, I think that this is a little optimistic claim, however, there is some evidence that it can be more effective for plaque control than a manual toothbrush . The Oral-B Pro 600 comes with only one brush head refill as standard which is the cross action. This also happens to be in my opinion the best brush head as it is relatively small meaning that it can reach even the most difficult of wisdom teeth. The cross action brush heads also have angles bristles which allow you to clean more effectively along the gum line. This is the most frequently missed area when cleaning and the most likely to cause gum disease. If you want to find out my recommended list of Oral-B Brush heads click here. The Oral-B Pro 600 electric toothbrush comes with a rechargeable battery and charging stand. The charging stand is simple in design however effective. It keeps the electric toothbrush upright when charging which is handy to prevent it from getting grimy. The charging station as with all the Oral-B range requires a 220-240v power supply and a 2 pin to 3 pin shaving adapter (unless you have a shaving socket in your bathroom. These can be picked up from Amazon pretty cheap. The Oral-B Pro 600 rechargeable battery will last for roughly 28 minutes and takes 5-6 hours to charge to full. The 28 minutes is OK for a single person using the electric toothbrush handle as it means that you can use it for a week 2 minutes twice daily. The Oral-B Pro 600 also comes with a rather simple battery indicator light. If I was to be critical, I would say that the battery indicator light could give a little more feedback as it only really gives feedback when the battery is on the blink. Due to the small size of the Oral-B Pro 600 23cm (height with head) x 2.5cm (width) x 3cm (thickness) the portability of the Oral-B Pro 600 is pretty good. It also has a relatively light weight of 124g (without the brush head). This means it is easy to carry with you on your holidays and can easily fit into your hand luggage. It does miss not having a travel case which is an extremely useful feature. I suppose you will have to wrap it up in some clothes to keep it safe in your luggage. To get a travel case you would have to look at the Oral-B Pro 650 which is practically the same toothbrush but with a travel case. This is one area that the Oral-B Pro 600 really shines. 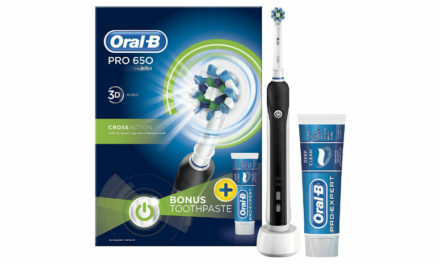 The recommended retail price of the Oral-B Pro 600 is £49.99 however out of the major retailers Amazon.co.uk provides the cheapest offer at £24.99 (+ Free UK Delivery) which is really quite a bargain price. 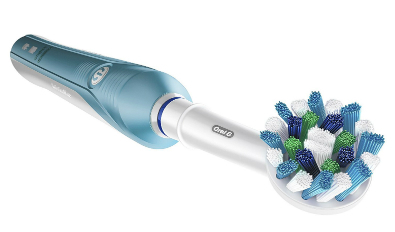 If you buy the Oral-B Pro 600 off Amazon it represents good value for money. The running costs of the Oral-B Pro 600 include the minimal amount of electricity used to charge the toothbrush, the water, toothpaste and replacement of the brush heads every 3 months (or until the bristles fray). Oral-B Cross Action Brush heads cost around £10.94 for four brush heads. As the Oral-B Pro 600 has an extended 3 year warranty, we can assume that the minimum amount of time you would keep it is for 3 years. Given a 3 year ownership and brush head replacement every 3 months, you are looking at only around 5p per day running cost which is extremely cheap for better oral health. This figure will only reduce if you use the Oral-B 600 for longer than 3 years. To ensure the rechargeable battery lasts as long as possible, do not keep charging it once the battery is full. 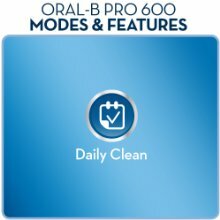 What alternatives are there to the Oral-B Pro 600? 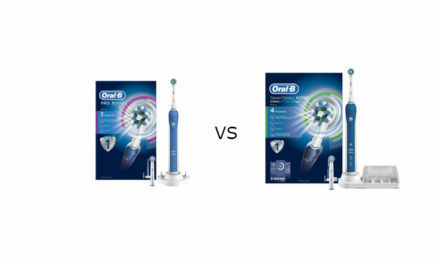 The main alternatives are the Oral-B Pro 650 and the Oral-B Pro 2 2000N. As these electric toothbrushes are more expensive they come with additional features. The Oral-B Pro 650 comes with a travel case and also is black in colour. The Oral-B Pro 2 2000N has an upgraded battery that lasts in excess of 2 weeks and also comes with an additional cleaning mode Gum Care. If you are looking for a sonic electric toothbrush take a look at the Philips Sonicare EasyClean Electric Toothbrush . Does the Oral-B Pro 600 have a pressure sensor? It does not have a visible pressure sensor (a red light that flashes) but it does come with a safety mechanism that stops the 3D oscillating rotating mode when you press far too hard. Does the Oral-B Pro 600 comes with a charging indicator? Yes it does. The Oral-B Pro 600 has a red flash when it needs charging, a green flash when it is charging and all the lights are off when it is fully charged. Does the Oral-B Pro 600 need an adapter to work? Unless you have a shaving socket in your bathroom, you will need a standard 2 pin to 3 pin adapter. This can be bought from most hardware stores or online on sites like Amazon. 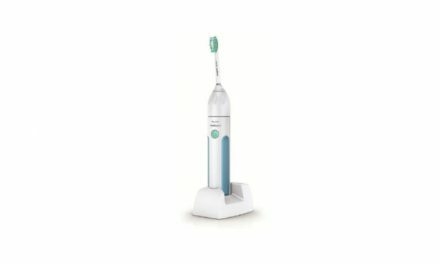 What Brush Heads can I use on the Oral-B Pro 600? You will be able to use any of the Oral-B range of Brush heads. D0 you have to use floss with an electric toothbrush? Yes you do still have to use something to go in between your teeth as electric toothbrush bristles do not properly clean in the tight space between your teeth. If you do not like floss another alternative is interdental brushes or tepe brushes. Yes it comes with a charging station that holds the electric toothbrush handle vertical so that it does not get grimy. Is the Oral-B Pro 600 waterproof? Yes the Oral-B Pro 600 is waterproof and can be used in the shower. It can also be cleaned with water which is useful when you need to get rid of the toothpaste stains. 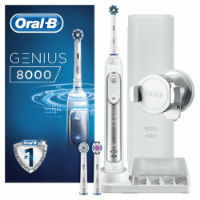 The electric toothbrush I tend to recommend is the Oral-B Genius 8000. It does depend on what you are looking for in an electric toothbrush. I would highly recommend taking a look at the post “Best Electric Toothbrush UK 2017”. Is the Oral-B Pro 600 suitable for children? Not really. This has been designed for older children and adults. If you are looking for advice about children’s electric toothbrushes I would recommend looking at the post “Best Children’s Electric Toothbrush UK 2017”. A pretty darn good effort for a moderately low ranged electric toothbrush. It definitely ticks most of the boxes. The only thing to consider is if a pressure sensor, a travel case and a good battery indicator are important to you. If they are not then definitely buy this toothbrush. Summary A solid budget electric toothbrush that performs adequately to clean your teeth. If you are looking for a cheap, basic electric toothbrush that does not have any of the premium features then this may be the toothbrush for you. NextWhat is the best camera for dental photography 2019?